The winter months can be some of the busiest for stores, but with peg hooks from the Do-It Corporation, you can display every item you need to sell and promote their sales. With a simple peg board style backing, peg hooks can be set up and be ready to go in seconds. If you have small product that needs somewhere to thrive, hang them up with peg hooks. One of the best parts about using peg hooks for your retail displays is their simple design and use. Shelving and placement of products frequently changes throughout the year, and peg hooks can ease the pain of having to move entire shelves over and over. 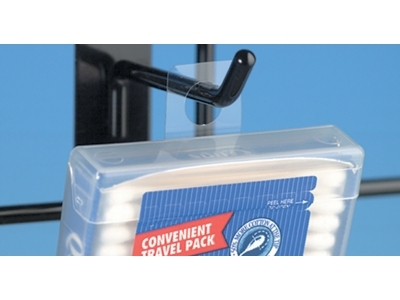 Able to hold items large and small, peg hooks from Do-It won’t let your products down. Able to hold almost any product, our peg hook solutions won’t let you down. Compatible with our selection of hang tabs, you can save space and bring visibility to your products. Sometimes certain products, because of their packaging, can’t sit on a shelf well, but with hang tabs holding the product on peg hooks, you can still display them in an easy and attention-grabbing way. When a retail shelf gets too many products lined on it, sometimes products get lost in the mayhem of colors and shapes that people see. By hanging items from peg hooks, you can bring a little more focus and clarity to how your shelves are laid out. Whether it’s the electronics department or the beauty department, peg hooks and hang tabs make a great addition to any section of a store to help your products sell. With 40 years of experience under our belt, the Do-It corporation has the knowledge and products to make your retail displays stand out. We have helped improve sales, given companies a variety of display options, and done it all while reducing overall packaging costs.